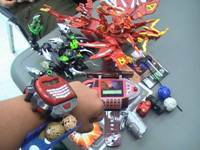 There is no better way to give thanks to your cherished Bakugan arsenal and bring in the 2010 Holiday season than to participate in Bakugan Dimensions Holiday Tournament! Gather up you most prized Bakugan that you've uploaded in Bakugan Dimensions from your real-life Bakugan's heat reveal DNA Codes. Put your most cunning online battle strategies to action against rival brawlers. Show the world your true calling by winning the title of The Holiday Tournament Champion... and take the hard-earned Championship Prize! The tournament structure starts with a tournament sign-up week starting on November 22nd and ending November 26th. Any level Brawler with any level Bakugan can sign up by visiting the official My.Bakugan.com community Bakugan Dimensions Holiday Tournament Sign Ups thread here. The first 32 brawlers to successfully sign up will be invited to compete in the Playoffs and Finals Day on December 4th where they will duke it out to claim the title as the Bakugan Dimensions Holiday Tournament Champion. 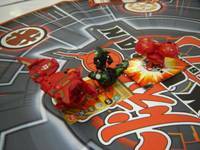 Ready your most devastating Bakugan team for the Bakugan Dimensions Holiday tournament! * Live playoff and finals bracket will be updated as soon as matches are completed during the finals. Click here to access the Bakugan Dimensions Holiday Tournament Live Playoff Bracket. Certain restrictions apply, not all may be eligible to enter. 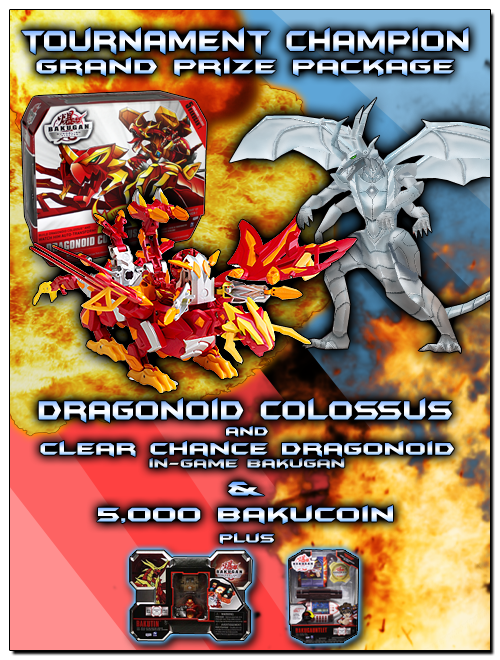 The Bakugan Dimensions Holiday Tournament is open to residents of the USA, Canada, and Australia. 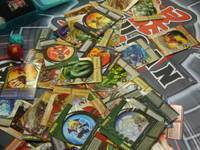 Read the Bakugan Dimensions Holiday Tournament Official Rules for more details. Prizes do not stack. Participants will win the associated prize package according to how far they get into the playoff rounds. Certain restrictions apply, not all may be eligible to win. 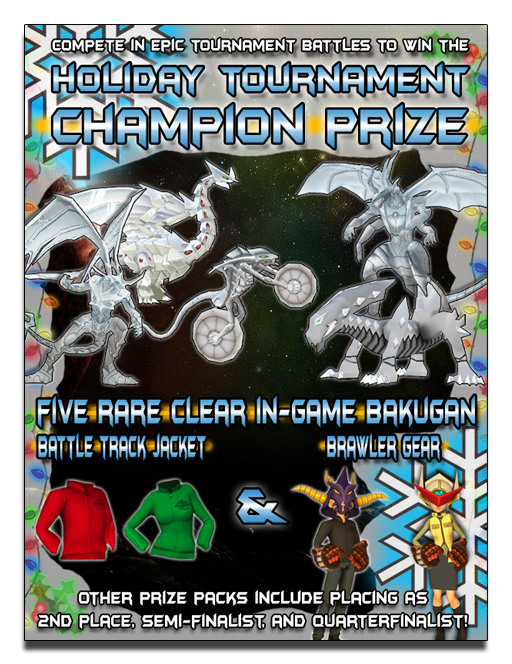 The Bakugan Dimensions Holiday Tournament is open to residents of the USA, Canada, and Australia. The first thirty-two players to successfully sign up during the Bakugan Dimensions Holiday Tournament Sign-Up week will be invited to compete in the Playoffs and Finals. The Tournament Sign-Up week starts on November 22nd at 1:00pm PT and ends November 26th at 1:00pm PT. At the end of the Tournament Sign-Up week, the first 32 brawlers who successfully sign up will be contacted by email with their designated playtime in the playoffs. If you wish to participate, sign up by visiting the official My.Bakugan.com community Bakugan Dimensions Holiday Tournament Sign Ups thread here. The Bakugan Dimensions Holiday Tournament playoffs and finals will be held on December 4th, with the first round consisting of scheduled matches starting at 10:00am PT. The playoffs and finals will consist of single-elimination style rounds. For each round, the brawler who wins their match will proceed to the next round. The Final round consisting of the two last standing brawlers will be a Best of 3 match round to determine the Tournament Champion. Live playoff and finals brackets will be updated as soon as matches are completed. Click here to access the Bakugan Dimensions Holiday Tournament Live Playoff Bracket. Participants who make it to the playoffs must show up on time to play their scheduled match. 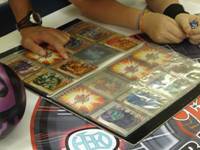 Playoff and final matches will be scheduled by the Bakugan Dimensions Tournament officials. No exceptions or preferred game times will be made. 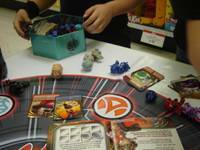 For more details on tournament rules and structure, refer to the Bakugan Dimensions Holiday Tournament Official Rules. If you are one of the valiant brawlers to be invited to participate in the tournament after signing up, please refer to the Bakugan Dimensions Holiday Tournament Playoffs and Finals Live Bracket for your scheduled match times. Playoffs Round 1 matches begin Saturday, December 4th from 10:00am – 11:00am PT with the full Playoff and Final day lasting approximately 3 hours.